I love a good French fish stew. 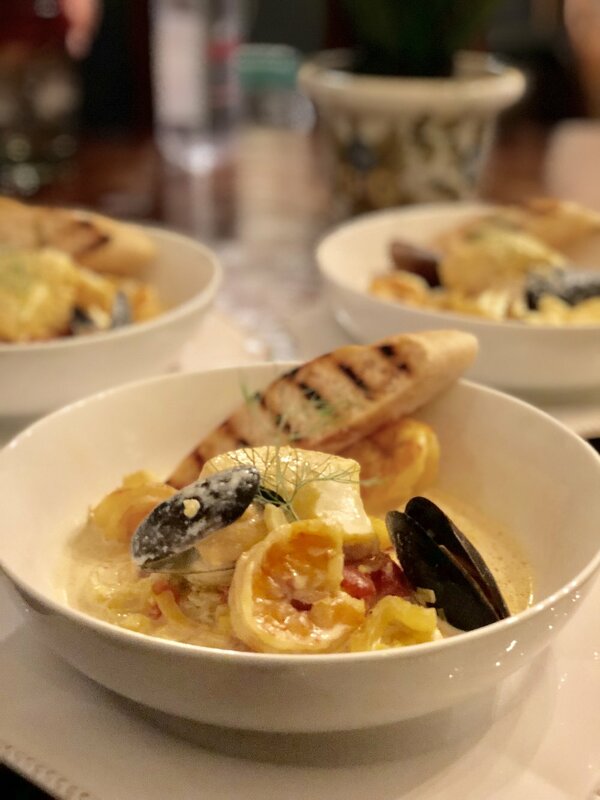 Either a Bouillabaisse, that is chock full of fish, shellfish, and mollusks, or what we are making this week on the In The Kitchen With Scotty segment of “Rise & Shine”… BOURRIDE! Bourride is a wonderful flavorful stew from the Marseille region of France. 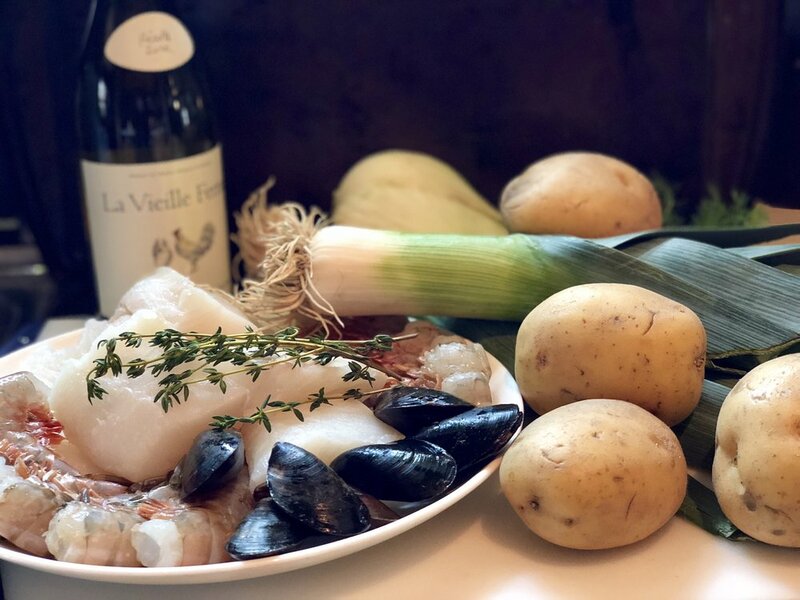 Full of provençal flavors and ingredients, gems from the sea, and the magic of garlic aÏoli that is…well, garlic aïoli! Perfect for the emergence of spring... still hearty and soul-warming but light in body with fresh flavors. Traditionally, as far as the fish part of this dish goes, Bourride is made with Monkfish. Mostly because monkfish if available in south France, and because it holds up really well in a stew. The trick is living in Oklahoma where Monk Fish isn’t so widely available and coming up with a great substitute. Those substitutes? Finding a firm white fish, even if that means a thicker cut, that is available to you. These choices can be Sea Bass, Flounder, and Cod. As far as what else you add to your stew could be lovely large prawns, mussels, langoustines, or whatever you enjoy. Now, what really sets bourride off and makes the dish complete is the addition of a rich garlicky aïoli. That’s all I’m going to say about that because truly if you make this dish (and I hope that you do) you will understand what I am trying to convey. Don’t be afraid… I have faith in you. Happy Cooking! In a blender toss in the garlic, egg yolks, and stock. Blend until the garlic has been minced. 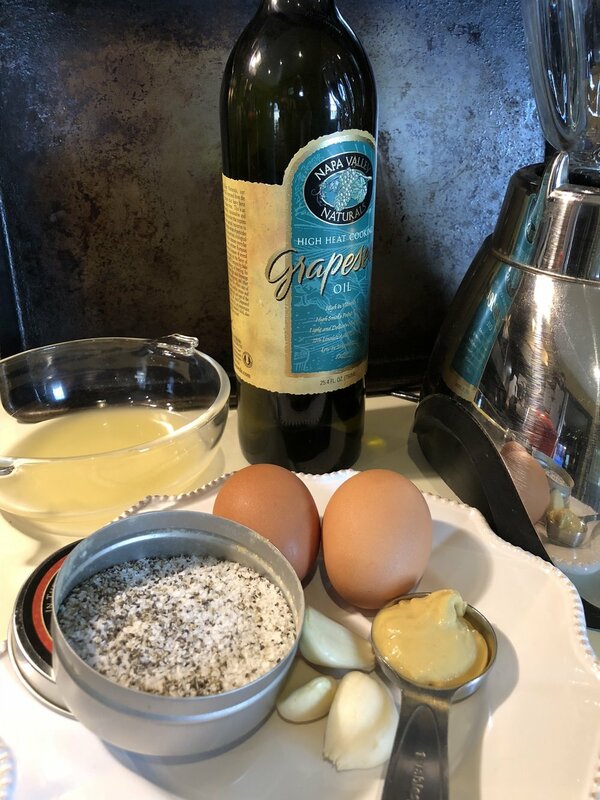 With the blender running, slowly and carefully drizzle in the grapeseed oil. This allows the egg yolks to emulsify with the oil coming together like a mayonnaise would. If you pout too fast to all at once, your sauce will break… and you will need to start over. Once the aïoli comes together keep covered and place in the fridge until time to finish off the bourride. Adding saffron to the sautéing leeks and fennel. Adding a dry white wine really brightens up this dish. In a large high sided skillet add a glug or two of olive oil… enough to coat the bottom of the pan. Begin to heat. Add the sliced leeks, fennel, orange zest, and saffron. Season lightly with a pinch of Cook’s Line Seasoning or salt and black pepper. Sweat (cook gently) for five minutes. Pour in the dry white wine, stir and cook, then add the one quart of fish stock. Layer in the potatoes, and I like to plan on 3-4 slices per person. Bring the soup to a boil then turn down to a light simmer. Cover and cook 15-18 minutes or until the potatoes are fork tender. If you are choosing to serve the bourride individually in a soup/pasta plates, place the bowl into a warming oven. This ensures after each step of loading up those bowls, that the bourride stays warm. If you choose to serve family style, place the platter in a warming oven. Once the potatoes are fork tender, with a slotted spoon, carefully remove the whole sliced potatoes and arrange them in the bottom of each bowl or on the platter. 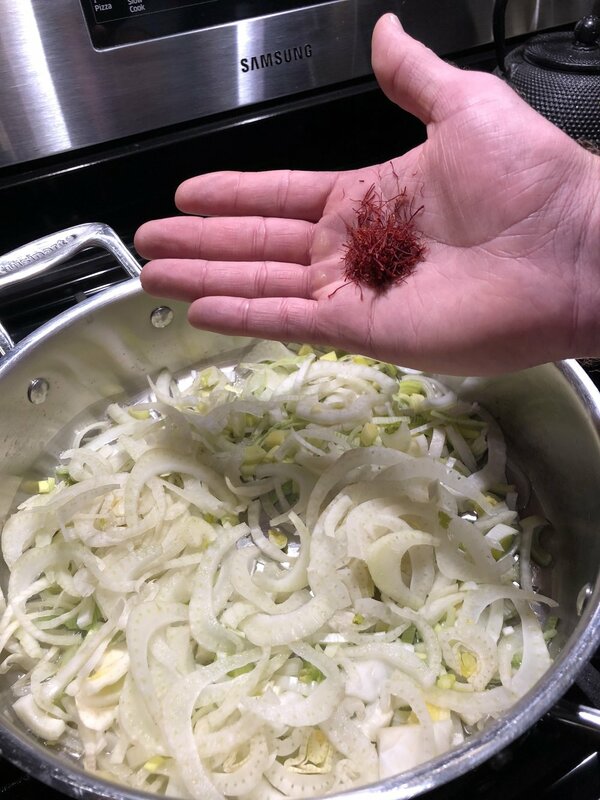 Next, remove the fennel, tomato, and leek, and divide them equally between each bowl. Again, if using a platter, spoon pout everything and arrange nicely. Place the bowls or platter back in the oven and start working on the fish. Season the fish with salt and black pepper. With the broth gently simmering add the fish. Depending on how thick the pieces are, cover and simmer approximately 5-7 minutes. Place the shrimp into the soup next making sure they are submerged in the broth to cook for 2-3 minutes covered. Lastly, add the mussels and cover to cook just until they have opened. Remove the fish, shrimp, and mussels and arrange nicely in the bowls or platter. Now it is time to add the garlic aïoli. The trick to this is to NOT simmer/boil the broth. It will split your aïoli and turn into a huge mess. Remove the pan from the heat.. then remove the aïoli from the fridge and place back onto the blender base. With a ladle, and once again the blender running, gently add the hot stock to “temper” the aïoli. Once you have a blender full of hot stock and aïoli pour the contents back into the pan. Remove the bowls or platter from the warming oven and generously ladle out the creamy rich garlicky broth over the top of the fish and vegetables. Top with fresh fennel “fern’ or chopped parsley. Serve with grilled baguette slices and a wonderful Rosé wine. Enjoy!